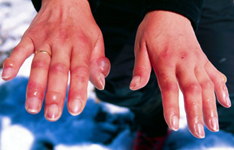 Frostnip is very similar to chilblains; however, instead of a red or blue appearance, it results in a white appearance. Frostnip is caused by exposure to cold/damp conditions and is seen with the beginning stages of Hunter’s Reflex, which is vasoconstriction of the extremities to help maintain core temperature. Tintinalli JE. Tintinalli's emergency medicine: A comprehensive study guide. McGraw Hill; 2011: Section 16. Knoop K. Environmental conditions. In:Atlas of emergency medicine 3rd ed. New York: McGraw Hill; 2010. Wittmers LE Jr, Pozos RS, Fall G, Beck L. Cardiovascular responses to face immersion (the diving reflex) in human beings after alcohol consumption. Ann Emerg Med. 1987 Sep;16(9):1031-6. Reichman E. Emergency medicine procedures; 2012: Chapter 189 Hypothermia Patient Management. Stone GK, Bowers,R. Current diagnosis and treatment. McGraw Hill; 2011:Chapter 46 Disorders Due to Physical and Environmental Agents. Johnson AR, Jensen HL, Peltier G, DelaCruz E. Efficacy of intravenous tissue plasminogen activator in frostbite patients and presentation of a treatment protocol for frostbite patients. 2011 Dec;4(6):344-8. doi: 10.1177/1938640011422596. Epub 2011 Sep 30. Turtiainen J, Halonen J, Syväoja S, Hakala T1.Rewarming a patient with accidental hypothermia and cardiac arrest using thoracic lavage.Ann Thorac Surg. 2014 Jun;97(6):2165-6. doi: 10.1016/j.athoracsur.2013.08.028.